How to bring your supplies with you in the field! Thus far, we’ve covered what plein air painting is, where to go to paint, and what to use for painting it. We’ve got one last problem though: how do we bring all our materials out into the field for plein air painting â€” wherever that field may be? Well, over the centuries artists have developed some very clever and convenient methods for travelling with art supplies, and they’ve only gotten better with time! To start with, let’s pick something to paint on! 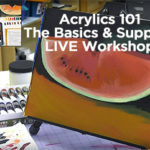 Whether you’re drawing on a pad of paper, painting on a watercolor block, or sketching with oils on canvas, a support is needed for any surface you plan to work on. Many artists stand while plein air painting, so a portable easel is a good choice. Special easels, often called French easels, were developed to provide not just support, but storage, and include drawers and compartments for carrying paints and brushes within the easel. However, French easels can be a bit of a hassle to haul around, so if you’re not in need of the storage as well, a simple travel easel can suffice. And conversely, if you plan to sit whilst painting, whether at a table or on the ground, a selection of table easels and drawing boards could be just the ticket! The key is to decide how best you like to paint, and choose the perfect plein air easel to match your style. 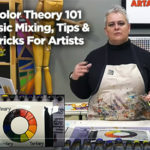 Painting palettes can be as basic as a plank of wood, or an incredibly complicated and specifically sculpted piece that’s an artwork in itself. Whichever style of palette you prefer, however, it is an absolutely necessary plein air painting supply! The surface on which you choose to mix your paint depends much on which painting medium you’re using. 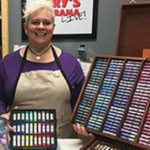 Watercolors mix well in a palette with wells so water doesn’t spill everywhere; oils blend nicely on smooth surfaces; and acrylics work great in a palette with an airtight seal that keeps them wet and workable. 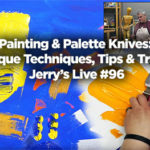 The choices are virtually limitless, and many artists like to keep quite a few palettes “in rotation” at any one time, to maximize their painting options. Very few paints are used completely alone â€” with no mediums, water or solvent mixed in. Using water or solvent widens the effects achievable in any given paint, but poses a problem for transportation. We can’t just bring a water bottle into the field and paint directly from it, nor lug a whole can of turpentine everywhere we go. Luckily, we have many options open to us for bringing fluids and mediums plein air painting, without spilling them all over the place. As with palettes, which container you choose depends on your paint â€” and hence whichever medium or solvent you plan to use with it! While we could go plein air painting with nothing more than a French easel, various bags, packs and carriers certainly make field life easier. Whether you need to carry extra paper and canvas, snacks and sunglasses, or every tube of paint you’ve ever owned, chances are you’re going to need a way to haul it around. Tote bags and satchels are perfect for sketchbooks and small supplies, with their wide array of pockets. Carts and bins are great for rolling heavy items and large canvases across rough terrain. And there are even special carriers designed for hauling nothing less than a whole easel! Going out into the field for plein air painting doesn’t need to be a hassle, if you’ve got everything packed up and ready to go! Wherever we go when plein air painting, however we get there, chances are after a while we’ll want to sit down and have a rest â€” or we may want to spend our whole painting session sitting. Since bringing armchairs and drafting stools into the field isn’t really an option, a good portable seat is invaluable. From a basic folding canvas stool to a comfy chair with included storage, finding a seat out in the open doesn’t have to mean plopping down in the dirt! And there we go! By now, we know all about plein air painting, where we should go, what we should use, and how we should bring it with us. And just in time, because plein air painting season is here! 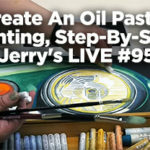 We hope you’ve enjoyed our tips and trips through plein air painting! What are your plans for the season? Spring into plein air season, and tell us about it in the comments below!